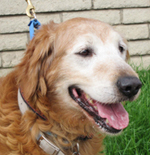 Bio: Windsor is a 9-year-old male golden retriever who was abandoned when his owners lost their home. A neighbor notified the shelter, who called us. 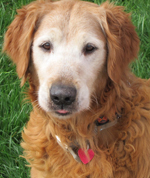 Don’t be fooled by this boy’s age or white face – he has LOTS of energy and loves to play. He does pull on the leash and has a stubborn streak if he doesn’t want to go where you go, but he has a fun personality and a sweet disposition. 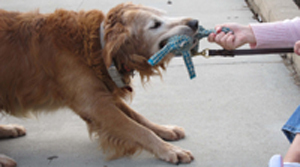 He loves to play with toys and balls and would prefer to be the only pet in his forever home. He’s looking for a family who will give him lots of love and make him a part of the family.